Here's how it works: When you visit a news site, blog, or some other Web page you like, you subscribe to it--usually by clicking a specially marked icon somewhere on the page. Once you've subscribed, new content from that site is automatically fed to your RSS reader (sometimes known as an "aggregator"), which can be either a application or a Web service. The goal is to see news and new posts under one roof instead of jumping from site to site to site. I recommend Google Reader. It's a freebie accessible from any Web browser (and most mobile phones), and it doesn't require you to install any extra software. There are many ways to add a site to your subscription list. You can look for the popular (and usually tiny) Add to Google button. Or you could look for a link that says RSS feeds (for example, PCWorld's Latest News feed), click it, and then click the big blue Add to Google Reader button that appears. But without a doubt my favorite option is the Google Reader bookmarklet. One click, and presto: You're subscribed to whatever site or page you're viewing (as long as it has an associated RSS feed). Head to Google Reader and click Settings, Reader settings. Click the Goodies tab, then scroll down until you see "Subscribe as you surf." Drag the "Subscribe..." link to your browser's bookmarks/favorites bar. That's all there is to it! When you click the bookmarklet, you'll be taken straight to Google Reader. There you'll see a few key stats about the feed (such as average number of posts per week) and a Subscribe button you click to complete the process. 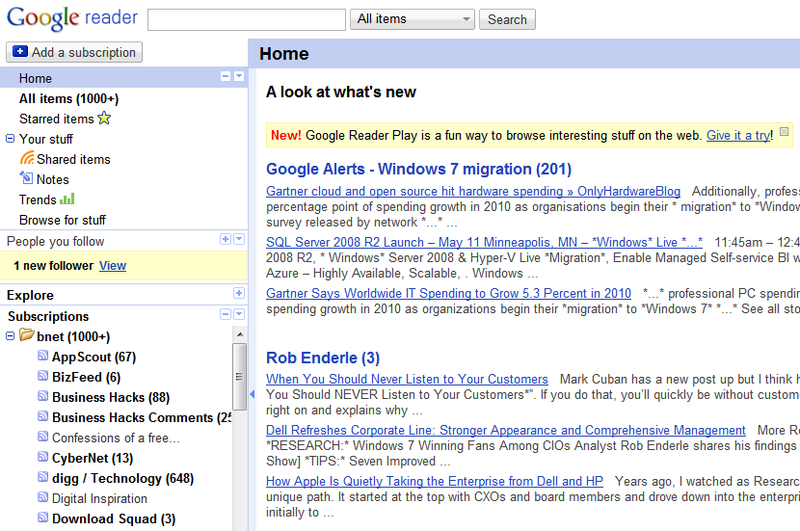 Like so many Google properties, Reader looks a little, well, staid. Fortunately, there's a simple way to add a little visual flair to your page: favicons. At the bottom of the Preferences, check the box marked "Show favicons for subscriptions." 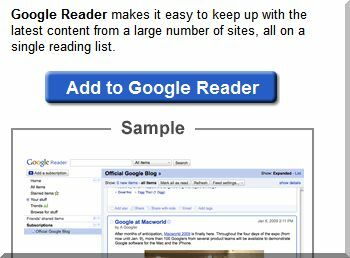 Click Back to Google Reader. 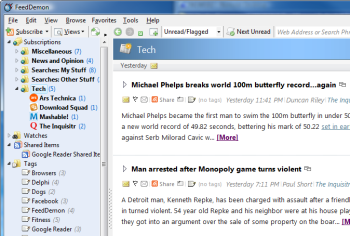 Google Reader is a great way to tap RSS feeds for viewing your favorite sites under one roof. Just one problem: How do you read your feeds when you're on an airplane? Or a train? Or anywhere else there's no Internet access? After all, Reader requires an active connection. Fortunately, there are plenty of programs that let you read RSS feeds offline. I'm partial to FeedDemon, which has one big ace up its sleeve: It syncs with your Google Reader account, meaning it pulls in all your subscriptions and even updates items' read/unread status the next time you get online. After installing FeedDemon, just jump into the settings and enter your Google Reader account info. The software will fetch your feeds and download all the latest entries so you can read them offline. Heck, you might just decide to start using the program full-time, as it offers a much prettier interface than Google Reader and a lot more features. Thankfully, FeedDemon's a freebie.